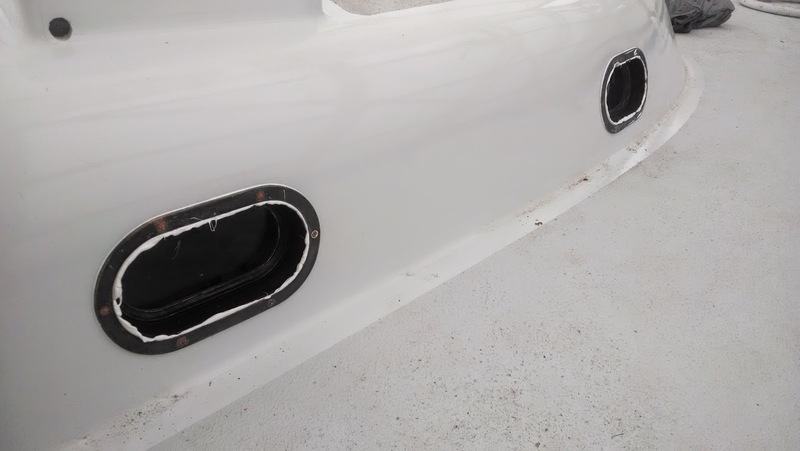 After a seemingly endless amount of work on the four opening ports I finally got them installed this afternoon. The work on the ports started almost two years ago to the day when I stripped the chrome off using my impromptu de-plater (details here). After that they pretty much sat around until late this winter when I finished cleaning them up. Then they sat again until earlier this week when I decided it was finally time to get them in. I had ordered some new bronze screws (#8 - 32 x 1") but they all had to be cut done to roughly 3/8" long (I don't remember if I couldn't find the right length or if I wasn't exactly sure because I didn't have any of the original screws). Once I cut them down I re-tapped each of the six screw holes on each port and made sure the newly cut screws fit properly. At that point I was ready to go. 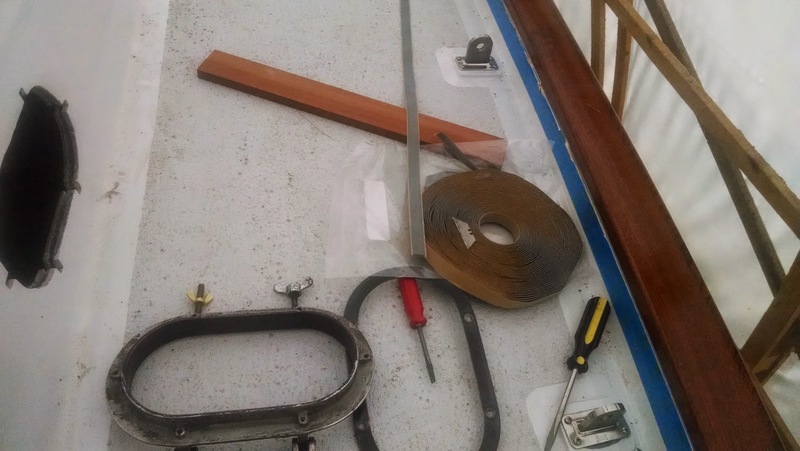 Originally I planned on using butyl tape to bed them, but I had a bit of a false start the day before yesterday when I applied the butyl tape to the inside of the frames and the trim cover and fit everything into place. Unfortunately because of the addtional width of the butyl tape the screws were too short to catch in the port frame no matter how much pressure I applied. After about an hour's worth of struggle I gave up, and pried the port off and took it back to the shop to get all the butyl tape off. Dammit! 1. Lay a thick bead of SikaFlex around the entire flange of the port frame. 2. 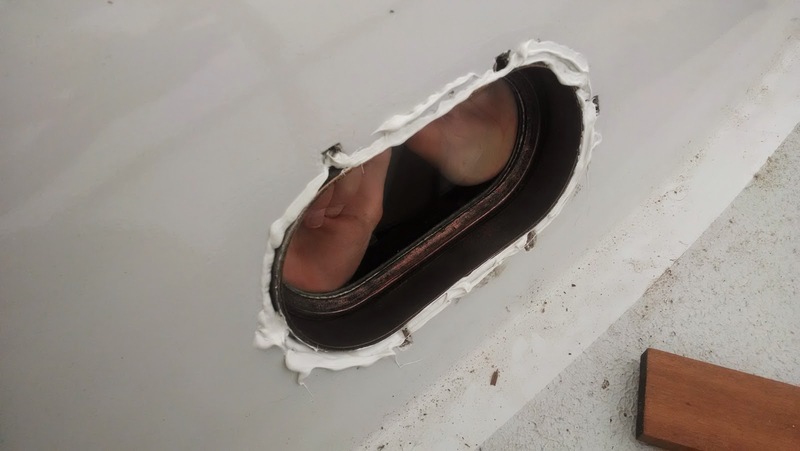 Carefully hand it to my son who was inside the boat. 3. My son presses the frame into the cut out in the cabin top. 4. Lay another bead of SikaFlex around the outside of the cut out. 5. Press the trim frame into place, squishing the bead of SikaFlex out. 6. Screw down each of the six 3/8" machine screws until I had good squeeze out around all sides. 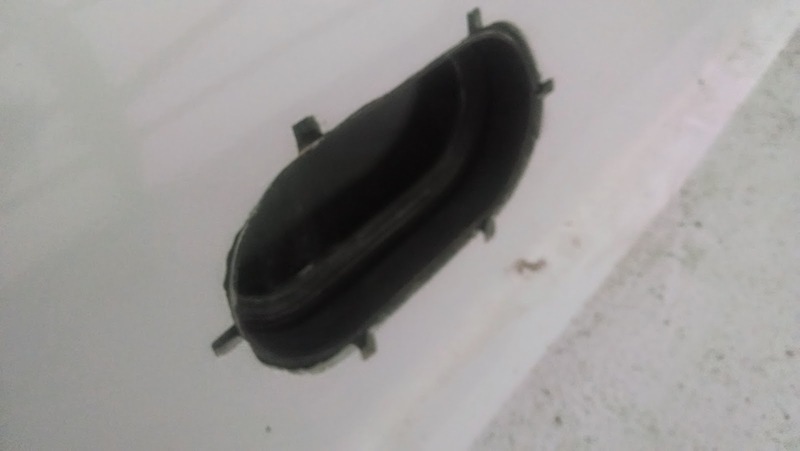 I cleaned up the squeeze out around the outside of the ports where it was on paint, but left the squeeze out where the port frame and the trim frame meet. I've found that unless it is on paint, SikaFlex cleans up better with a razor once it has cured. I'll do that tomorrow, so technically the project isn't complete, but I'll take it as a win. 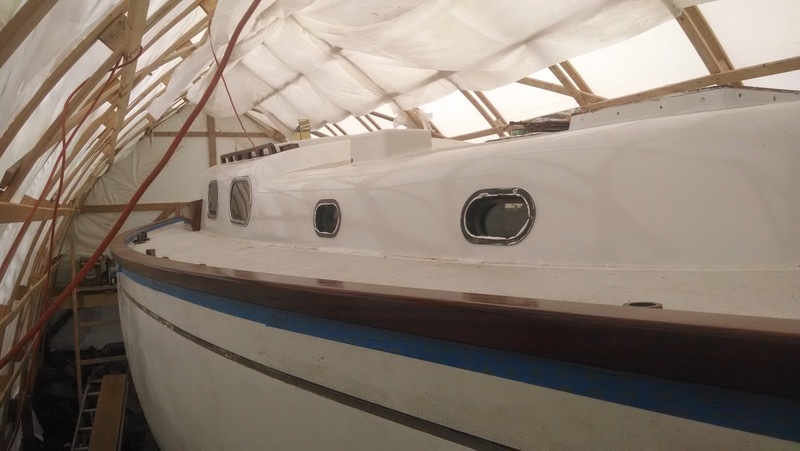 I had been dreading the whole thing because I was worried that I would end up stripping one of the screw holes that I had re-tapped or the trim frame wouldn't sit flat. In the end, the final installation only took an hour. Forward port looks slightly off in the photo, but it's just the angle.